While it’s clear that Thiessen is never at a loss on what to serve while entertaining, we had to know: If Kelly Kapowski was hosting a dinner party, what would be on her menu? “You know Kelly to me is one of those girls that is just all ice cream sundaes and candy,” says Thiessen. “She’s always upbeat and lovely and sweet, so I always think bright colored food that has a 1950s feel.” Noted! 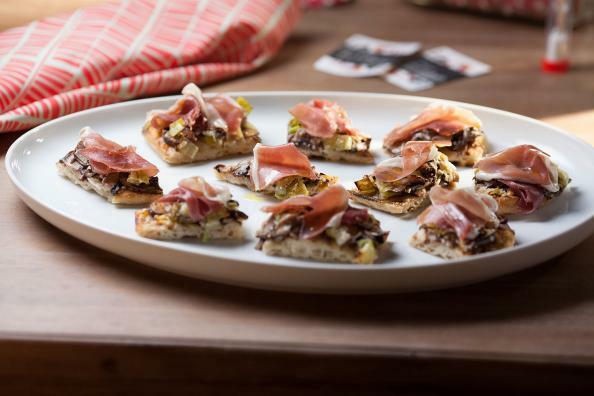 Scroll down to get Thiessen’s recipe for Mushroom Leek and Prosciutto Pizza and be sure to tune in to tonight’s premiere ofDinner at Tiffani’s at 10 p.m. ET on the Cooking Channel. 1. Preheat the oven to its highest setting (500°). Preheat a cast-iron grill pan to medium heat.